The recent NYTimes article has inspired me to try a new veggie burger recipe. I love the chickpea version from 101 Cookbooks — the microgreens are the key ingredient– but I want less of a Middle Eastern flavor and more of the great burgery patties we get at Umami Burger and Houstons. I’ll let you know how the jalapeno version, below, works out! Do you make veggie burgers? Do you like a specific bean base (black beans, chickpeas, etc.)? Or do you go more for mushrooms? We’d love to know. 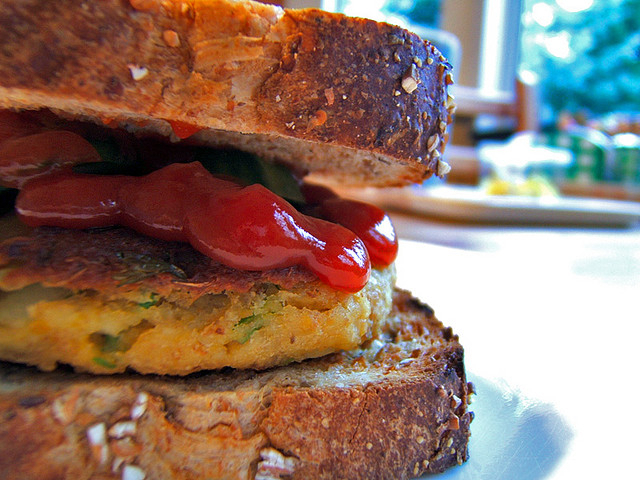 We’ve been experimenting with veggie burgers too! Also inspired by 101 Cookbooks (the lentil version: http://www.101cookbooks.com/archives/vegetarian-lentil-burgers-recipe.html), we found that these resembled turkey burgers in their aroma and hearty look. VERY yummy. Using leftover bread for the crumbs kept it simple and potentially gluten-free. Best part? The leftovers froze well and freed us from constantly restocking the Morningstar Farms! That picture looks scrumptious! I think I’ve had mostly chickpea base, but I’d be willing to try anything. The soft shell chicken tacos sounds delish.